Anyone remember William of Ockham? (Thanks Wikipedia). Occam’s razor? The simplest explanation is usually the best? Well, it’s rarely like that when explaining the body. It turns out the pain system has a middle bit. A bit between the nerve endings and the brain. Who knew? And why? Why make it so complicated? In this article we concentrate on this middle bit of the pain system, the spinal cord. It starts at the coccyx and travels all the way up your back to your brain. 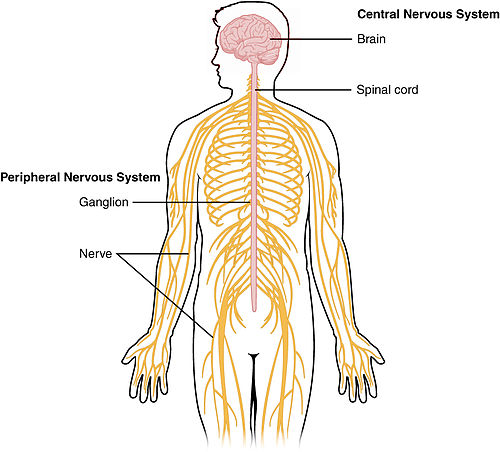 The peripheral nerves, discussed in the last blog, provide the inputs to the system. They can be thought of as alarm bells. They feed messages to the spinal cord from all parts of the body: skin, tendon, muscle, bone, organs and even nerve tissue itself. These messages are simply danger signals. It is then the job of the spinal cord (the preprocessor), and the brain (the main command centre) to analyse them and create a meaningful experience/response. This experience may or may not include pain. The messages from the peripheral nerves are quite basic e.g. the temperature in the tissue has increased, the acid level has decreased, there is more pressure etc.The complex sensations that we feel in response such as strong pain, tearing, stretching, throbbing, aching, crawling etc are all created by the brain. What occurs in our tissues is only one part of the pain experience. The messages from the tissue require evaluation by the rest of nervous system. The spinal cord is the first part of this evaluation process and it determines what messages are transferred from the peripheral nerves up to the brain. The spinal cord is a network of nerves with vertical lines up to the brain and back down from the brain along with collateral lines connecting the vertical lines. There are many junctions or synapses where peripheral nerves connect. The spinal cord acts as a preprocessor, "sorting" the incoming signals. It can both block and amplify messages. One of the nerves back down from the brain is able to flood the junction of the peripheral nerve and the spinal cord with chemicals that block any messages travelling up. It does this when the brain perceives that the whole body is in imminent danger of some external threat and it needs to act to escape the threat. Blocking pain in this way enables someone with a broken leg to run away from a lion or to complete a 400m relay race in the Olympics - as Manteo Mitchell did for the U.S. Team in the 2012 Olympics qualifying race. The peripheral nerves from different parts of the body have their junction with the spinal cord at different levels of the back. The foot connects at the very bottom of the back whereas the hand connects at the bottom of the neck. On one side of the body there are thirty one entry points called dorsal horns that run down the spine from the neck to the lower back. A message from the peripheral nerve causes the end of the nerve to release chemicals into the gap or junction at the dorsal horn. These chemicals attach to the end of the nerve coming down from the brain causing a message to fire up to the brain. When we get a long lasting or strong input from a peripheral nerve to the spinal cord and up to the lower brain (the brain stem) the neurons (the cells of the nervous system) change their reaction to the input. They become more sensitive and send up a greater reaction than the input represents. Such changes do not take long to develop. A few minutes of strong input from a peripheral nerve is sufficient to change the sensitivity. This “central sensitisation” is similar to an unwanted learning process. Once it has occurred the pain experienced can become more intense and continuous than the stress or load in the tissue warrants. In this state messages from the junction can be fired up the spinal cord to the brain even when there has been no input from the peripheral nerves. These changes in firing patterns occur not only at the level that the initial strong input was experienced, but also to adjacent junctions above, below and on the opposite side of the spine. Current research is investigating theories that phantom pains which manifest in areas of the body disconnected from the original injury can be caused by chemicals flooding the gaps between the dorsal horns. Whilst an oversimplification it perhaps helps understand what might be happening. The theory is that whilst a referred pain may be bio-mechanical it may also be, in effect, chemical i.e. caused purely by the pain system’s chemical transmission of the original stimulus, not by a bio-mechanical consequence of the original stimulus. What happens when central sensitisation develops? The result of this increased sensitivity is that the brain is being fed messages which do not represent the true state and abilities of the tissue, so that an area that hurts a little can hurt a lot, and an area that didn’t hurt at all can start hurting. Once sensitisation has occurred preventing the pain becomes more difficult.It may not simply be a case of removing the stimulus that caused the initial nerve signal or allowing the tissue to heal. You also have to unlearn the pain response. A patient who has suffered a sudden short-lived pain that is relatively mild is unlikely to have central sensitisation. Treatment can often produce a dramatic resolution of symptoms and the patient can sometimes feel immediately better. However if central sensitisation has occurred this sudden turnaround rarely happens and in some cases hands-on treatment can make the patient feel worse as it further stimulates the irritated nerves. Changing this learned behaviour requires a gradual calming down of the system, which takes time. What are the indicators of a sensitised nervous system? Pain starts in a very local spot where the ‘injury’ first occurs then spreads and moves around the tissue. The pain becomes ‘illogical’ in that it doesn't fit the pattern of how much stress or load has been put on the tissue. It becomes less predictable. Random pains occur in other tissue e.g. a hamstring starts to hurt when it is the calf that has been injured. The pain is mirrored on the other side of the body. The physical input e.g. load, damage is proportional to the physical output e.g. pain, swelling, etc. Active fellrunner Mr T arrived at the clinic with achilles pain. He had just done his first parkrun. When asked where the pain was he pointed with one finger to an exact spot on his achilles. His achilles tendon wasn’t used to the different loading patterns of running flat out on tarmac for a relatively short period of time. The pain worsened with any faster running and uphill running, but did not occur with activities such as walking and long slow runs, which place less load on the achilles. There was a consistent pattern to the manifestation of the pain - it was very localised and increased and decreased with increasing and decreasing load. After tuning his training load and adding extra strengthening work he returned to normal training but understood that he needed to build up to races that would place his achilles and other tissues under different loads. Mr P booked in for physio 3 weeks after he sprained his ankle. The pain he was experiencing seemed commensurate with the severity of his initial injury, a quite nasty sprain right at the start of a fell race which was very swollen for several days with significant bruising. Three weeks on he had regained full movement and reasonable balance and could hop with only mild ache. He was set for moving forward with rehabilitation to get back to running and racing. However Mr P was concerned. The ankle was still painful. He could feel it throughout the day even with walking and especially worrying was that the light pressure of his trouser leg or the duvet caused pain. Due to this pain he was trying to protect the ankle and avoid anything that could harm it further. Assessment of strength, movement and function combined with knowledge and experience of typical healing times lead me to feel confident the ankle was mending well. Once this was explained to Mr P his concerns regards damage and harm were alleviated and the process of building up strength to return running could begin. Butler D.S, Moseley L.G (2013) Explain Pain, Noigroup Publications.